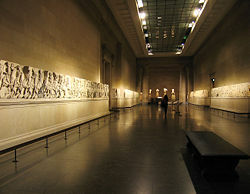 General view of the room displaying the Elgin Marbles. The Elgin Marbles (IPA: /'ɛl gən/), also known as the Parthenon Marbles or Parthenon Sculptures, are a large collection of marble sculptures removed from Athens to Britain in 1806 by Lord Elgin, ambassador to the Ottoman Empire from 1799 to 1803. The sculptures were purchased by the British Parliament from Lord Elgin and presented to the British Museum, London in 1816 where they have remained on display to the public. Ever since the extradition of these Elgin marbles from the Parthenon, international debate, controversy, and outrage has surrounded the friezes, about how the antiquities had been "defaced by British hands." It is ambiguous about whether Lord Elgin was legally entitled to these art pieces as he obtained them from the Turks, who were then in charge of Athens' permission to control the Parthenon. The terms and responsibilities continue to be disputed to this day. Unfortunately, due to the dispute over ownership and placement, the beauty and majesty of these wonderful works of art has been under-appreciated. Although Elgin may be criticized for his methods, it should also be remembered that they were typical of his time. His intention was to bring the pieces to safety, even spending considerable resources to rescue the shipload that sank, and make them available for public display. The mission of a museum, and the British Museum continues to advance this purpose, is to display artworks to the public and to keep them safe. Appreciation of these monumental works of art is therefore a priority for future generations. During the first ten years of the nineteenth century, Lord Thomas Elgin (British Ambassador to Constantinople 1799-1803) removed entire boatloads of ancient sculpture from Athens. The pride of this collection was a huge quantity of fifth century B.C.E. sculpture from the Parthenon, the temple to the goddess Athena, which stood atop the Acropolis. Taking advantage of Ottoman occupation over Greece, Lord Elgin obtained a firman for their removal from the Parthenon from the Ottoman Sultan. They were eventually purchased by Parliament for the nation in 1816 for £35,000 and deposited in the British Museum, where they were displayed in the Elgin Room until the purpose-built Duveen Gallery was completed. These have come to be known as the Elgin marbles. The Honourable Lord has taken advantage of the most unjustifiable means and has committed the most flagrant pillages. It was, it seems, fatal that a representative of our country loot those objects that the Turks and other barbarians had considered sacred. The abduction of small parts of the Parthenon, of a value relatively small but which previously contributed to the solidity of the building, left that glorious edifice exposed to premature ruin and degradation. The abduction dislodged from their original positions, wherefrom they precisely drew their interest and beauty, many pieces which are altogether unnecessary to the country that now owns them. John Keats was one of those who saw them privately exhibited in London. His sonnet On Seeing the Elgin Marbles for the First Time, which begins "My spirit is too weak," reveals the deep impression these sculptures had on him. Some scholars, notably Richard Payne Knight, insisted that the marbles dated from the period of the Roman Empire, but most accepted that they were authentic works from the studio of Phidias, the most famous ancient Greek sculptor. Statuary from the east pediment. The left hand group of surviving figures from the East Pediment of the Parthenon, exhibited as part of the Elgin Marbles in the British Museum. 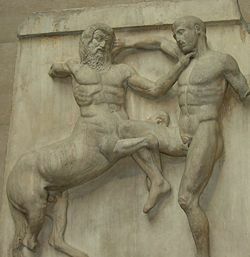 The Elgin Marbles include some of the statuary from the pediments, the metope panels depicting battles between the Lapiths and the Centaurs, as well as the Parthenon Frieze which decorated the horizontal course set above the interior architrave of the temple. As such, they represent more than half of what now remains of the surviving sculptural decoration of the Parthenon: the Elgin marbles and frieze extend to about one kilometer when laid out flat, 15 out of 92 metopes; 17 partial figures from the pediments, as well as other pieces of architecture. Elgin's acquisitions also included objects from other buildings on the Athenian Acropolis: the Erechtheion, reduced to ruin during the Greek War of Independence (1821–1833); the Propylaia, and the Temple of Athena Nike. Lord Elgin took half of the marbles from the Parthenon and wax casts were produced from the remaining ones. At present, about two-thirds of the frieze is in London at the British Museum and a third remains in Athens, although much of the Athenian material is not on display. There are also fragments in nine other international museums. Considerable debate surrounds the meaning of the frieze, but most agree that it depicts the Panathenaic procession that paraded from Eleusis to Athens every four years. The procession on the frieze culminates at the east end of the Parthenon in a depiction of the Greek gods who are seated mainly on stools, on either side of temple servants in their midst. This section of the frieze is under-appreciated as it has been split between London and Athens. A doorway in the British Museum marks the absence of the relevant section of frieze. An almost complete copy of this section of the frieze is displayed and open to the public at Hammerwood Park near East Grinstead in Sussex. To facilitate transport, the column capital of the Parthenon and many metopes and slabs were sawn and sliced into smaller sections. One shipload of marbles on board the British brig Mentor was caught in a storm off Cape Matapan and sank near Kythera, but was salvaged at the Earl's personal expense; it took two years to bring them to the surface. The Greek government has claimed that the marbles should be returned to Athens on moral grounds, although it is no longer feasible or advisable to reposition them at the Parthenon. As part of the campaign, it is building the New Acropolis Museum, designed by the Swiss-American architect Bernard Tschumi, designed to hold the Parthenon sculptures arranged in the same way as they would have been on the Parthenon. It is intended to leave the spaces for the Elgin Marbles empty, rather than using casts in these positions, as a reminder to visitors of the fact that parts are held in other museums. The new museum plan also attracted controversy; the construction site contains late Roman and early Christian archaeology, including an unusual seventh century Byzantine bath house and other finds from Late Antiquity. A range of arguments has been expressed by British Museum spokespersons over the years in defense of retention of the Elgin Marbles within the museum. The main points include the maintenance of a single worldwide-oriented cultural collection, all viewable in one location, thereby serving as a world heritage center; the saving of the marbles from what would have been, or would be, pollution and other damage if relocated back to Athens; and a legal position that the museum is banned by charter from returning any part of its collection. The latter was tested in the British High Court in May 2005 in relation to Nazi-looted Old Master artworks held at the museum; it was ruled that these could not be returned. The judge, Sir Andrew Morritt, ruled that the British Museum Act – which protects the collections for posterity – cannot be overridden by a "moral obligation" to return works known to have been plundered. 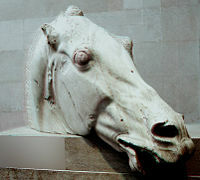 It has been argued, however, that connections between the legal ruling and the Elgin Marbles were more tenuous than implied by the Attorney General. Lord Elgin was neither the first, nor the last, to disperse elements of the marbles from their original location. The remainder of the surviving sculptures that are not in museums or storerooms in Athens are held in museums in various locations across Europe. The British Museum also holds additional fragments from the Parthenon sculptures acquired from various collections that have no connection with Lord Elgin. Less than 50 percent is on public display and some is still on the building. ↑ Epaminondas Vranopoulos, The Parthenon and the Elgin Marbles Retrieved September 23, 2007. 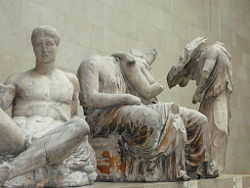 ↑ The British Museum, The cleaning of the Parthenon Sculptures in 1938 Retrieved February 25, 2011. ↑ Ian Jenkins, Cleaning and Controversy: The Parthenon Sculptures 1811–1939 (British Museum Occasional Paper No. 146. British Museum Press, 2001, ISBN 0861591461). Retrieved September 23, 2007. ↑ The Parthenon sculptures: stewardship The Britisn Museum. Retrieved February 15, 2011. ↑ Ruling tightens grip on Parthenon marbles guardian.co.uk (May 27, 2005). Retrieved February 15, 2011. ↑ What does the Feldmann case verdict mean for the Elgin Marbles Elginism (June 3, 2005). Retrieved February 15, 2011. Elgin Marbles: fact or fiction? Dr. Dorothy King. guardian.uk. This page was last modified on 14 September 2017, at 15:34.